The migration of Shenandoah from physical journal to virtual one and our absence from the world of literary publishing for six months while we transform has me thinking about the hunt-and-peck totemic bird to the left. 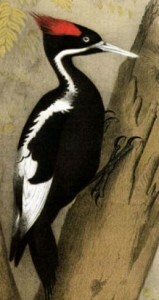 The ivory-billed woodpecker (campephilus principalis), once widespread among the swampy regions of the American South, has long been invisible and considered extinct, though survived by its cousin the pileated (whose beak is black, markings different, especially the wing undersides), a pair of whom hunt grubs, flash among the trees and lift spirits in the woods near my house, despite everything “developers” from the depths of the abyss have done to destroy any living thing. The ivory bill, as you can guess, was long sought by trophy seekers, hat designers and other misguided collectors for the glory of his plumage and for his beak, which some thought a fine novelty watch fob. The largest and most elegant of woodpeckers (sometimes over 20″ high with a 30″ wingspan), the ivory bill has had many nicknames, including “the Grail Bird” and “the Lord God Bird,” due to the expression that often accompanied its appearance. These days some call it “the Elvis bird,” as a result of all the unrecorded sightings, and one documentary film christens it “the ghost bird.” Even MIA, it attracts a lot of notice.